Have you tried beets in a chili recipe before? Its the perfect dense texture that will fool the most ardent meat-eaters. Some of my meat eating friends always complained that vegetarian food doesn’t seem to feed the soul! In my quest to show them some delicious vegetarian meals that are comforting too, I went on a quest for hearty ingredients. That’s how I discovered that roasted beets are a great way to make any meal dense and hearty. For one, it has beets. They give this vegetarian chili a very “meaty” texture. To the point that you will not even notice that it doesn’t have any meat in it. Also included in this recipe is habanero peppers. They are high on the scoville scale so they will make for a spicy meal. If used correctly, the habanero can add the perfect level of spiciness to any recipe. 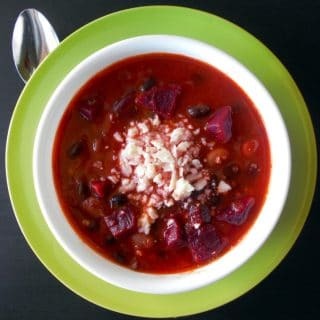 I have tried this vegetarian beet chili recipe in the past without the beets and they just feel and taste like soup. So, I make sure that I include beets in every one of my recipes. The beans are also a star in this recipe. I went with pinto beans, black beans and kidney beans. I think that is enough beans, right? All 3 beans contribute a delicious flavor to this recipe. 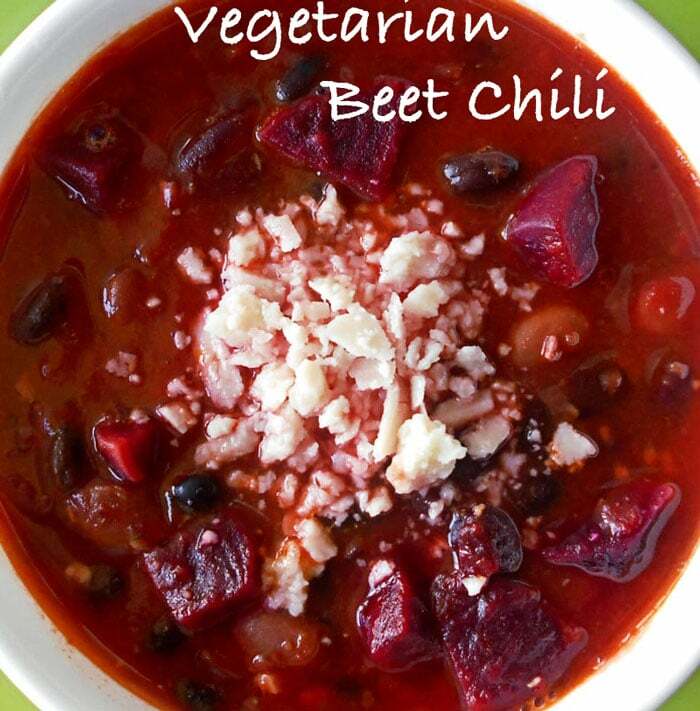 Give my vegetarian beet chili recipe a try and let me know what you think. I also have a vegetarian chili with mushrooms which is just as delicious and hearty. For beet lovers, I have a super healthy and delicious beet salad, beet hummus, beet canape and beet tart recipe that you just can’t resist. Remove the vegetarian beet chili from heat and adjust taste if needed. Sounds delicious. My brother would love this so will try it when he comes for dinner. I’ve not read your blog before but really enjoyed the rambling style. I’m not keen on cliches either, and kick myself when I find myself doing them. What about when people do speech marks in the air? So annoying. Debated with myself about whether to put speech marks round kick myself too. Happy cooking. There’s no beetin around the bush on this one.. It’s awesomely healthy! BEETS,BEETS Good for the HEART! Ha! I love beets so much, I eat them right out of the can taken right out of the cupboard. Imagine my squeals of delight when I found this! I use to have a huge garden and grew beets and turnips (love them too, great fried with an onion!) among tons of other delights! I am going to try this! Thanks for posting it! G’day! So healthy, delicious and colorful today! Shared some of your blog love today! YUM! Thank you so much, Joanne. Your are awesome for sharing my blog!! I’m sitting here trying to think of a funny cliche to make you laugh and my mind is blank. I guess I’m not used to speaking in cliches. I know a lot of people that do and I wonder how they remember so many cliches. I don’t get offended tho, I think they mean well and just don’t know how to express their feelings. Thank you so much Sylvia! I truly appreciate your comments. I know people mean well with their cliche responses. I just think it is effective to use my own words as much as I can. You are in Tampa and only a stone throw away from me. Why don’t you come by someday and we will share a bowl of chili!